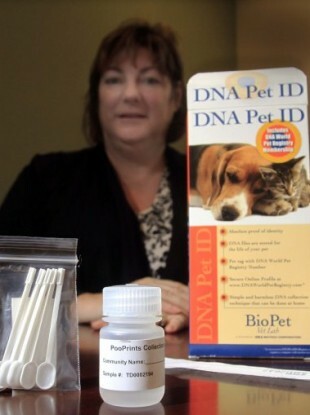 Debbie Violette, an apartment complex manager in New Hampshire, with a DNA test kit for pets. LANDLORDS IN THE US believe they have come up with a solution to their dog-poo dilemma and the answer is in the DNA. Some property owners have employed a scientific laboratory to test dog droppings for DNA so they can find and fine the culprits. According to a report on ABC News, a manager in an apartment building in New Hampshire got so fed up with cleaning up after her tenants dogs, she looked to science for an alternative. Deborah Violette, manager of the Timberwood Commons apartment complex, said letters and notices warning pet-owners to use their pooper-scoopers failed to have any impact so she contacted PooPrints, a dog DNA testing laboratory in Tennessee. Everyone who has a dog in the complex now has to swab their pooch’s cheek for DNA and Violette mails it to the lab, which keeps it on file. PooPrints then hands out faeces collection kits to landlords who find unwanted dog drippings on their properties. When dog droppings are found, the finder collects a small amount of the faeces as evidence, puts it in a solution and mails it back to the lab. According to ABC News, there are currently 20 properties in the US which use the kit but this number is bound to surge. The idea has caught on and now landlords in New York are demanding DNA samples from their residents’ dogs, according to the Daily Telegraph. In Florida, one condo association has told pet owners they have to pay a one-time $200 fee to keep their dog’s DNA records on file. “The smell is disgusting. Residents are embarrassed to have company. Dog crap is everywhere”. But what happens to the offenders? Fines, eviction, lose the dog? Violette says in her complex owners will be given one warning if their dog’s DNA matches that of an uncleaned pile. “If it happens again, they are going to have to leave or remove the dog,” she added. There’s no messing with science. There are about 75 million pet dogs in America. That’s a LOT of poop. Actually, the Daily Telegraph says about 1.1 million tonnes of poop goes unscooped each year. A pile can take a year or more to fully breakdown. Ugh! Pet owners in New York can pay up to $650 in a a one-time pet fee and some pay monthly rent for their canine. Email “Owners beware: Landlords turn to dog poop DNA tests ”. Feedback on “Owners beware: Landlords turn to dog poop DNA tests ”.